Decatur, Ala. – Thousands of history buffs and visitors will make their way to the LaGrange College Site the first weekend in May to commemorate the burning of LaGrange College during the Civil War. 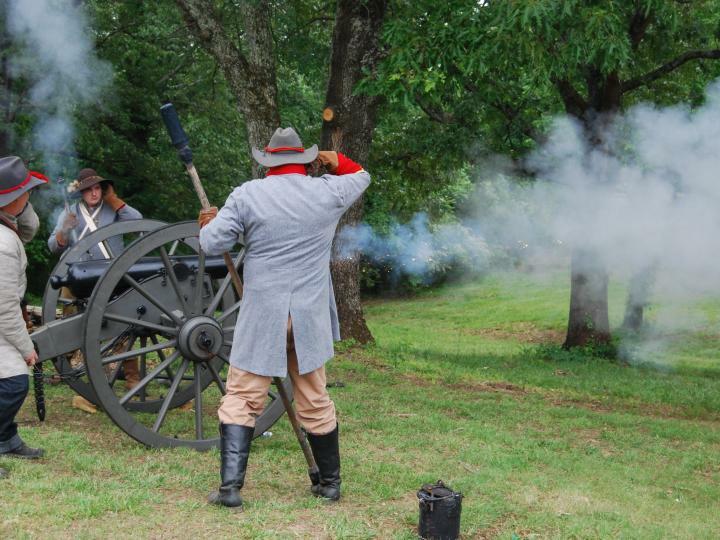 Now in its 31st year and designated an official Alabama Bicentennial event, Recall LaGrange features re-enactors dressed in period clothing, Civil War camp life, demonstrations and more taking visitors back in time to an important part of North Alabama’s heritage. Set for May 3-5, 2019, the three day event is sponsored by the LaGrange Living Historical Association. Recall LaGrange kicks off on Friday, May 3rd and this year’s event is an official Alabama Bicentennial event. A Collector’s Bicentennial Edition of Recall LaGrange program book (filled with Alabama history) will be available during the event for purchase. Friday is designated school and senior day. Group tours are asked to pre-register by calling 256.446.9324. The main event is slated for Saturday, May 4th. Throughout the day, there will be living history events, reenactments, demonstrations and wagon rides to the historic LaGrange Cemetery. Set for 2 p.m., Still Raid on the Mountain reenactment centers on a prohibition era raid on a moonshine still. Displays include antiques and fragments of period moonshine stills and a skirmish by lawmen. Additional activities include a Civil War Living History Encampment, tours of a nearby distillery, a vintage car exhibit, blacksmith demonstrations, tours to a nearby rock shelter that was once home to the Paleo Indians, an art and craft show featuring vendors from across the southeastern United States, musical entertainment and tours of log buildings located onsite. The Alabama Bicentennial Table once owned by Senator Charles Tait who prepared the bill that was used for Alabama statehood will be on display. Festivalgoers will want to plan a visit on Sunday, May 5th for tours of the pioneer log buildings and grounds of the old college site. Additional activities include Civil War camp life, arts and crafts exhibits and demonstrations, wagon rides to the historic LaGrange Cemetery and more. Hours are 10 a.m. to 4 p.m. daily. Admission is free and parking is free. Donations will be accepted at the gate for up-keep of the historic park and cemetery. For more information, call 256.446.9324 or Colbert County Tourism at 256.383.0783. On January 11, 1830, LaGrange College opened with an enrollment of 70 students, becoming the first state chartered college in Alabama. The enrollment peaked at 139 in 1845. Dr. Richard H. Rivers became president in 1854, and moved the college to Florence, Alabama in January 1855. It was chartered as Florence Wesleyan University on February 14, 1856, and is known today as the University of North Alabama. After LaGrange College moved to Florence in January 1855, a group of LaGrange citizens reorganized the college in the vacant buildings under the old name. To increase the patronage, a military feature was introduced in 1857. The college reopened in February 1858, as LaGrange College and Military Academy. The Academy soon flourished and became known as the “West Point of the South.” In 1860, the name was changed to LaGrange Military Academy. By 1861, the enrollment was almost 200 cadets. During its existence, 259 cadets from nine states attended the Academy. In 1861, many LaGrange cadets left to join the Confederate Army. Consequently, the Academy was forced to suspend classes on March 1, 1862. On April 28. 1863, Colonel Florence M Cornyn and his Destroying Angels of the Northern Army swept through the valley and burned the academy. Recall LaGrange takes place at the LaGrange College site located in northwest Alabama, 8 miles southeast of Muscle Shoals, off Highway 157. The physical address is 1491 LaGrange College Road, Leighton, Ala. For more information, visit www.lagrangehistoricsite.com.